When did Avon get cool, ya’ll? Did it happen while I was in the potty? As far back as I can remember, Avon was something that “mature” women wore (aka my grandma), but lately I’ve come across a number of Avon products that are well, kinda awesome. Take the Glazewear lipstick pictured above. Pretty, yah? That’s Juicy Apricot. Not quite a lipstick, not quite a gloss, this shimmery peachy-coral shade delivers shiny, sheer color that feels light on my lips. Avon calls it feather-light and says the non-sticky texture has to do with their Color-gel formula. The formula stays put for about 3-4 hours and comes in a sleek, slim black tube. Lately, I’ve used Glazewear as an alternative to traditional, thick, goopy lipglosses. They pack plenty ‘o shine without the thick gloss look. At $8, Glazewear fits into the budget friendly segment, and the product is surprisingly easy to find. I previously thought you had to buy Avon through Avon representatives, but you can purchase their products directly from Avon online. There’s a fantastic sale on Glazewear lipsticks right now, with 15 shades, including Juicy Apricot, on sale for just $3.99! Can you say 50 percent off, ladies? I loves me a bargain! I’ve also been hearting Champagne Glow, which you can see in action in this face of the day. How do you feel about Avon? Are they on the right track? wow, that is a bargin. and very pretty! (one of my other key makeup words is “gel”). I *think* that Jillian Dempesy, who is a big Hollywood makeup artist and was the creator of the now defunct Delux Brand, has joined Avon? but I’m not entirely sure. If so, maybe that has something to do with it? (and yeah, more random useless knowledge she is married to McDreamy). I’ve not really tried much lately. Avon has always been on the derm’s no-no list. But like I said before the mascara i picked up was pretty awesome, so I may have to give Avon another look too. Did you pick up anything else? I didn’t know when Avon got cool again myself, but apparently it did! Christines last blog post..Looks – Naughty Nauticals Bright with Soft Pink Lips! omg four dollars!? i’m DEFINATELY going to order one. i just wish they sold avon in stores. i love how it’s not too glossy and gives just the right amount. I am about to run out of my Neutrogena Stress Control face wash, I was wondering if you had any recommendations for acne-prone skin? Could be drugstore brand (which would be preferred) or more of a high end brand. Greatly appreciate it! Yep, Avon has come a long way with their products. I remember first hearing about them from their Skin So Soft bath oil. My mom used it on me when we went on a trip to the Philippines years ago. It was supposed to prevent mosquito bites. Haha! But their Mark. line (targeted at younger women) has a lot of cool stuff, and I’ve liked everything I’ve gotten from them! I recently got their GlossBlossom Ripening Tint Gloss, for $6 (which is JUST like Smashbox’s O-Gloss, which retails at $22) and it has a WONDERFUL light feel and is like the opposite of goopy! It’s really slick feeling and fruity tasting! I think they’ve really shaped up their image! And plus, you don’t have to know an “avon lady” to get it, you can just get them from their site!! Ugh… 4 bucks?? Now it’s only right to buy at least two! That Mauve Moon sounds nice. I wonder what other goodies they have. I haven’t really tried much! Interested in trying though. This apricot shade from Avon is simply delicious. This is the perfect colour for spring and summer 2008! I like this year’s makeup shades because they are so tropical. Yes! I always thought you had to have an “avon lady” to purchase. I’ve looked at their website a couple times and have always been amazed by their prices, but I’ve already done the Mary Kay-thing and didn’t want to have to go that kind of route again, you know. I’ll have to give this a 2nd look. I think they use lots of oils and stuff into products. A few other items from the mineral line fell into my hot lil’ hands. I haven’t tried ’em yet… I hope they don’t break me out! Shoot, I gotta find that mascara now. I know that you are picky about your lashes so it must be good! I know, right? Hope you’re having a good week so far! Yah, me too. It would be easier if you could just play with the testers and see how the textures look in person, for sure! I have tried a few Juice Beauty products. I remember the cleanser smelling very strong. Hmm, how about using your Proactiv cleanser on your acne-prone spots? In the past, I’ve washed my acne hot spots (forehead and chin) with Proactiv and then used a gentle, non-foaming cleanser everywhere else. My favorite cleanser is Philosophy’s Purity Made Simple. It washes off makeup and cleanses my skin thoroughly, but never leaves it feeling tight or dry. It doesn’t foam which takes some time to get used to, and it has an “herbal” scent that turns some people off. I love it though and always recommend it to my girlfriends! I tend to go for gentle face cleansers without lots of bells and whistles… I just need it to remove my makeup and clean my face without leaving it tight. Is your skin dry or oily? When mine was super oily a few years ago I loved Basis Face Wash (in the tube). Now that my skin is drier now I love Philosophy’s Purity Made Simple. It’s kinda pricy though, so another drugstore cleanser that works for me now is Neutrogena Visibly Even Foaming Cleanser. Hope this helps! Yah, I’ve used it in the past to prevent mosquito bites, but it really doesn’t do much for me. I think the bugs like my blood :(. I wore some hiking while in Hawaii a few years back and the bugs went to town on me! I know! I swear it’s like I woke up one morning and Avon was all of the sudden really, really cool. I’ve never used any of their old lipsticks, but I can say Glazewear doesn’t have a taste — there is a slight smell but it’s easy to ignore. I totally want to get some of their Mark. stuff! 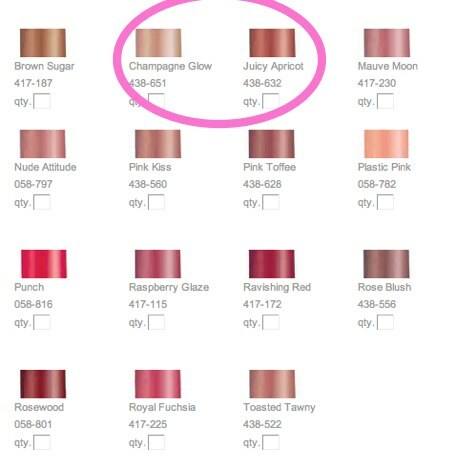 I want the the Shimmer Tubes Gel Blush (the lazy girl in me says OH YEAH) and the cute Hooked on Glamour Kits. That’s what I’m sayin’. Fifty percent off gets me *every* time, girl! I’ve been loving on the tropical shades as well, especially the corals. You should! Being able to buy it online is a big plus… I think it makes it a bit more accessible. Hi Karen, Juicy Apricot looks really pretty on you! Not too sparkly, very corporate office appropriate. This reminds me of the Chanel Glossimer Lip Gloss entry that you wrote last year in November, and Astral #104 was LE at your side. Please don’t be jealous *wink*, but it’s available in Singapore (in fact it is ongoing) and I just got it two days ago! It’s beautiful. However, (major disappointment) Gazelle is not available here. Not even with the Summer 2008 Collection. I am so not having luck finding corals that suit me well. I tried on the Clinique glosses this weekend and it was way too sticky for me! he problem I have with most corals is that it tends to look ashy on me, is that weird? But, I want juicy coral-tangerine lips! beautytalks last blog post..Pigment Love! Yay for Avon! I think it copies most of the ideas from MAC and make them prettier and cheaper. Glazewear lipstick probably is the same as MAC slimshine. And Avon also has a mineralized duo eyeshadows that are similar to the ones MAC released last year as a LE. I had to throw in my 2 cents, about a month ago Avon president or somebody of that caliber was in Charlie Rose so that’s how I know. Tanyas last blog post..Manic Monday. Whew! I’m so glad that someone else thinks Avon is cool! I was beginning to question my taste/judgement, as I have other old-lady like habits/qualities. I haven’t tried any of their makeup (don’t want to make MAC jealous), but I’m in L.O.V.E. with their nail polish. You can usually find it on sale for $2.99 or $3.99. Their selection isn’t vast, but the basic colors are covered, including shimmers & glitters. The reason I really love it is because it’s the only polish that will stay on my paper-thin nails for at least 3 whole days without the tiniest chip. All other name-brand polishes chip on me, usually within hours, or I’ll notice a chip the next day while driving to work….and that’s with seche vite topcoat. So, anyway, yeah Avon!!! Yeah Avon’s gotten a lot better. I especially like Mark’s products and see them recommended all the time in beauty mags such as Allure. I’ll definitely try some of the glazewears. That apricot shade is lovely. Thanks for the heads up on the sale!